98% of customers would recommend this product to a friend. Review: The hair is soft, lovely and fairly full! Review: I just received my wig today and I am completely satisfied with it. 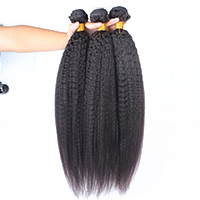 The color and texture are amazing, the length is perfect. 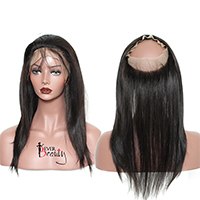 I was a little worried because I never purchased a human hair wig before but this unit is perfect for anyone trying out human hair wigs for the first time. The shipping was fast and the part I enjoyed the most was the great communication between the shipper and myself.. I highly request this wig for everyone! Review: Awesome communication and great product the hair is very beautiful and soft! Review: Pros: Very Soft and beautiful even after Co wash (had a wave once wet) , No Smell, Density is thick and natural, love the cap construction, very good quality, and worth the price (even came with a pair of lashes) Cons: Shipment took a week, hair sheds but very little. Review: It fits me perfectly. The baby hairs are amazing! Soft, doesn't shed very much. I would definitely purchase again. Seller had great communication and was so sweet!! Review: This wig is absolutely stunning! My stylist loved working with it. It was true to color length and density! Will be ordering 2 more! I am definitely impressed! Review: got the hair today and i got it sooner than i thought. İts natural well cared and bushy so thank you so much Mike!! thank you again you got yourself another happy customer! Review: I love this wig,sadly my friend messed up the frontal for me but I will be ordering again! Review: They were easy to contact and always available to answer questions/concerns. Received my order sooner than expected. The hair is very high quality. I've received so many compliments on my hair and I absolutely love it. They will be my go-to going forward! 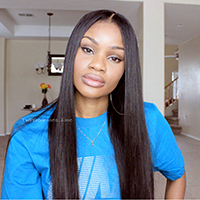 Review: I love the quality, texture and density of this hairpiece lace frontal wig. It arrived earlier than expected and gives me plenty of room to work with. I can't wait to color it. Review: this hair is awesome ...omggg i love the hair; tis soo beautiful; and very good communication btw we both. can't wait to install it. Review: I received my hair a day earlier than I was suppose to. I love the texture of the hair, it does have a little shedding but other than that the hair is nice so far so good. Review: This is the most beautiful lace wig I have ever seen. Well worth the money. I received my shipment in three days from the seller to Long Island NY. The seller was very friendly and made sure to stay in contact with me throughout the process. I will be customizing this wig tomorrow and will post pictures as well as an update. Review: A little shedding, but other than that, everything is great. Can't wait for my beautician to make the front it look more natural. Review: Fast shipping Communicated very well and fast ! Hair is soft and purdy Will order again and upload pictures soon Thank you so much ! Review: Awesome Communication. Quick Delivery & Great Product. My wife is very happy. Highly recomend!! Review: I was very pleased with the hair. Good delivery. Great communication with the seller. 5's across the board. Mike! You have exceeded my expectations!!! Review: I love the hair. I tried it and it fit perfectly and it is lovely, communication was instant and it arrived a day early. Review: I'm very happy with my purchase. Mike was great about keeping me updated throughout the process, and the hair arrived within a week. Really good quality hair. The hair didn't have any weird smell and was soft to the touch when it first arrived. Even after the first wash and condition, the hair maintained its silliness and didn't tangle. Shedding is minimal, even now that I've had the hair for a little more than 2 weeks. It's very full and thick as well. Review: Amazing service and equally amazing hair! very soft , I don't know anything about wigs so I haven't installed but excited to wear it! Hair is really good quality! Review: The seller is really nice, I washed and conditioned the hair! The hair ultimately is very nice I like it a lot! the hair is really good quality! I bleached the knots on the lace so that it could look like my scalp and the bleach did well with the hair! Over all it's decent hair! Review: I love the hair. I tried it and it fit perfectly and it is lovely, communication was instant and it arrived a day early. Very happy customer. Review: This wig is AMAZING!! 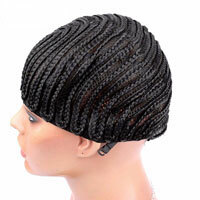 The hair very thick and does not shed ...Wig is on a greatly "structured" cap. My wig was a little too big but they provided me with a strap that I can sew-in and also some lashes. The communication was awesome and shipping was in 2days. Will be doing bulk orders from her next time. days after ordering which is always a plus. hair arrived after just a couple of days. I recommend this seller.T his is 18 inch. is the best!!! THANK YOU!! Review: LOVE you !!!!!! !That is exactly the hair that I expected,250% density is super full, and so soft and no any smell. No shedding and tangle, The communication was very accurate. Every time I text and ask a question, they came right back and answer, I can’t find another vendor that is better than ComingBuy, for they give me a super cool shopping experience for both customer service and products, I would definitely recommend this unit and will be ordering again. Love you!!!! !